The average person has three unconscious and little developed higher bodies: etheric body (prana, chi), astral body, mental body, and possibly even a causal body (corresponding to the buddhic plane). Esoteric magic knows only four bodies. Spirituality develops still higher bodies parallel to the Jivatma with different symboliysm. The student on the path develops such higher bodies which enable the final enlightenment (Moksha), when the spiritual Jivatma unites with the Paramata-Purusha (or the Dharmakaya). In the secret iconography of the mysteries were therefore symbolic persons developed. The buddhist Samaññaphala - Sutta mentions the ability to create a spirit-created body (manomāyakāya) as the fruit of a contemplative life. 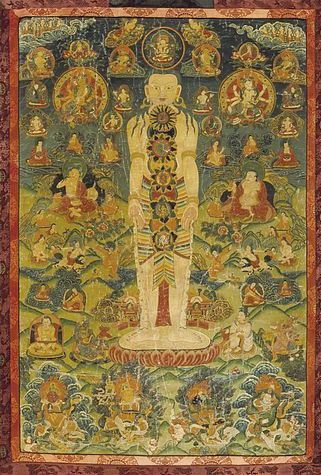 In Mahayana - Buddhism and Vajrayana exist theories about the spiritual spiritual Trikaya - bodies . Previous meditations serve the preparation and purification. Enlightenment is here synonymous with permanent entry into the dharmakaya body. The Vajrayana teaches also about a a. Vajra - Body ('luwa') with channels (Wyl. rtsa; Skt. nadi), Wind-energys(Wyl. rlung; Skt. prāṇa) and essences or tiklé (Wyl. thig le; Skt. bindu). This sadhana also includes the Tsa Lung Tigle - exercises. The Blue Beryl of tibetan medicine contains drawings of Nadis and chakras. 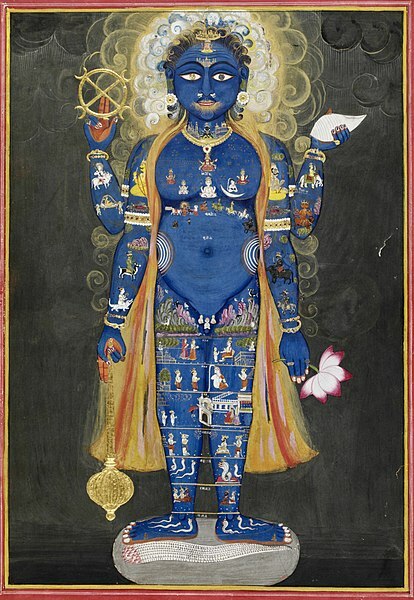 The Vedanta revolves around 3 bodies : Karana sarira - Kausalkörper, Suksma sarira - subtiler Körper, Sthula sarira - physical body. These bodies do not correspond to the 5 Koshas around the Atman. Higher yoga-bodies are the Jivatma, the Purusha and the Paramatma - Purusha. The Laya Yoga of Yogi Bhajan describes 10 bodies : The material body, three mental bodies and six energy bodies. An eleventh body contains the divine tone (Shabda) and is in a state of nondual consciousness . Chakras('whirls of energy') are parts of these higher bodies. The are connected across energy-channels or Nadis. There are up to 32 chakras mentioned in the Yogabooks. In indian Tantra as in the Shat Chakra Nirupana (Sans. Ṭaṭcakranirūpaṇa) at least seven main chakras are mentioned as well as a series of secondary chakras. Goraksanath mentions other chakras distributed in the body. According to Satguru Sivaya Subramuniyaswami, there are seven other underworld chakras under the Muladhara-Chakra.